Exploring solar energy to enhance community power is the focus of a new energy plan being developed by the Okanagan Indian Band. The band will receive $18,000 through the B.C. 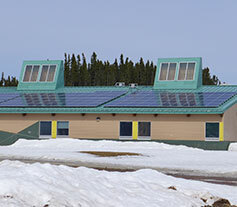 First Nations Clean Energy Business Fund to identify ways for the community to benefit from solar power. This includes a feasibility and business-case study on the viability of a solar rooftop system to support the community’s energy demands. Hedgehog Technologies has been hired to develop the plan in consultation with the Okanagan Indian Band. This includes conducting an energy audit and a cost-benefit analysis. Potential benefits of installing a solar rooftop system include supplying the community with more reliable power, and reduced greenhouse-gas emissions. For the long-term, the plan can help the band identify revenue-generating clean solar-power projects and employment opportunities. Capacity funding provided through the B.C. First Nations Clean Energy Business Fund is for assisting clean-energy project feasibility studies, community energy planning or engaging with project proponents. Funding for this project and other agreements is part of the Province’s commitment to reconciliation with First Nations. This includes ensuring more nations are involved in economic opportunities that make their communities and the rest of the province stronger.